As I’ve mentioned in earlier posts, when my family and I travel, it’s rare we’ll pass up a trip to the top of a skyscraper. I’ve already written about our visits to New York’s Top of the Rock, Malaysia’s Petronas Twin Towers, and Taiwan’s Taipei 101. When we went up Taipei 101 and my sons learned the skyscraper lost its highest building status by a new structure built in the Dubai, they started nagging me about when we would see it. 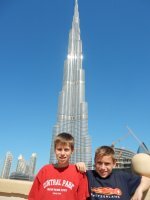 So when our travels took us through the UAE recently, I couldn’t let them miss out on a visit up the world’s highest skyscraper. The Burj Khalifa stands 828 meters tall. It was designed by the Chicago office of Skidmore, Owings & Merrill, with Adrian Smith as chief architect. Construction began in January 2004, and was completed in October 2009. It officially opened in January 2010. The skyscraper has a y-shaped design, with a central core that creates a thin spire at the top. 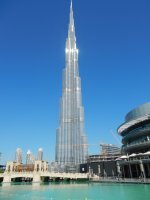 A glazing system is designed to withstand Dubai’s extreme summer temperatures. Part of the building is residential. It also houses the Armani Hotel. There are ticket times to the observation deck throughout the day and night, book ahead on the web site and pick up your tickets a few minutes before your scheduled time. The wait is minimal. The view from the top is impressive. The Dubai is a city constructed in a desert, and you can see this clearly from up on high. We enjoyed our time up the Burj Khalifa, and our wander underneath in the Dubai Mall, with its ice skating rink and full-scale aquarium. Enjoy your visit to birds-eye perspective of this desert city. For other Dubai tips, see my earlier post about visiting the gold souk.